Victor and I are SO looking forward to the day that we don’t live in the city. We aren’t city people. I mean, don’t get me wrong: I love trash pick-up, public transportation, and corner drugstores. But the list of things I want to get away from is so much longer! When we moved to our new house last year, the greatest thing that appealed to us was the backyard. Yes! Grass! Grass means chickens! This week was an eventful week though: on Wednesday our first little chickie eggs hatched, and so now we have four little chicks. Then yesterday morning we killed our rooster, so now our backyard is a safe place again! Free from the talons of that tyrant! We didn’t really know how to go about the killing of that guy… I mean, I remember my grandmother killing chickens. And Victor’s mom raises and kills her own chickens. But Mamaw and my suegra aren’t here. So Friday night, I did my research. (Seriously, what did we ever do without internet?) Armed with new knowledge, I told Victor what I had watched and read about–and together, we crossed a line. Let me be clear here: Victor killed the jerk, but then he left him, hanging up on the fence and went to work. So it was up to me to do the rest of the work. It’s no joke. They make it look so easy on YouTube!! And I made quite a few mistakes. But once the feathers, head and feet are off a dead chicken, he just looks like something from the grocery store. I won’t lie and tell you that it was easy. Somehow I cut the wrong bone, and I am covered in cuts on one hand from trying to clean out the cavity. But, I did it. Let me tell you, if people had to do this every time they wanted chicken, there’s no way we would eat as much meat as we do! So, last night we had beans cooked in chicken broth. I have boneless skinless breast and thighs in my fridge, and two chicken legs are ready for roasting. Not to mention, that mama hen starting laying eggs again two days after her pollitos hatched, so we had egg sandwiches for breakfast! Ahh… the urban farm life… And such a peaceful one without listening to that gallo singing to us all day long!! My first year in Mexico I flew home for Thanksgiving. Since Ale was born, I’ve stayed in town and prepared a Thanksgiving meal for my family and the other extranjeros, or foreigners. This year, my party grew, and so did our turkey! I’ve become less intimidated about cooking turkey. I think it is over emphasized, and this year I appreciated an article that helped me to feel better about my bird: 17 Thanksgiving Turkey Mistakes Everyone Makes I bought my bird too late. I thawed him outside of the fridge overnight. He weighed 11.75 kilos (about 25 pounds). I just slapped some butter on his breast, used salt and pepper to season him, and cooked him upside down for 4 and 1/2 hours before flipping him over for the last 30 minutes. Better yet, he continues to be perfect. Victor’s been snacking on turkey for two days, today we had turkey sandwiches for lunch, and I’ve made SO much broth from the bones and little bits of meat! Next up is a turkey pot pie with some leftover pie dough. Yummo! This turkey will feed us for weeks!!! In a pot, boil all those goodies you take out of your turkey (neck, lungs, etc.) Save this broth for your dressing. Crumble and chop all ingredients listed above into a large bowl. Add broth until everything is moistened. Add salt and pepper to flavor the dressing. (You can taste it here–all the ingredients are cooked, so no worries of getting sick!) Throw this into a casserole dish, and pop in the oven and bake until the top is crispy. Enjoy! The best part of this Thanksgiving was the preparation: two of Ale’s aunties came over to help us get ready and prep the food/ house for company. Having them here as I busied about the kitchen was really special. It made my family holiday seem more like a family holiday! What I didn’t count on was the major exhaustion from being on my feet for 14 hours cooking and entertaining! I didn’t count on being eight months pregnant while preparing turkey, dressing, and homemade rolls for 20 people wearing me out–but it sure did! That night I went to bed with an achy body, contractions and cramping, and fell asleep singing to Ale. Victor said I kept trying to sing to her after I was asleep. Whew! Who knew that hosting Thanksgiving took so much work! Wow! I have a friend who always tags her foodie pictures with #foodismylovelanguage. And I get it! Because there are a few of us who show others how much we love them by feeding them every opportunity that arises. I love preparing special meals for our visitors–surprising whomever I can with a meal from their homeland. I had a game night for Minnesotan friends from work where I made Tatertot Hot-dish. Ick. They loved it. I didn’t. When our visiting worker from the Dominican Republic vetoed Italian food, I cooked an all day affair which turned out to be Sancocho. Sometimes I like to ask if anyone wants something special–and I have whipped up everything from chocolate chip cookies to cornbread and beans. I don’t just cook foods from other places for other people though–often I will think of someone, then cook a food that reminds me of them. For example, I have been really homesick for Chiapas lately. I normally visit there during the summer months, but we are skipping our trip this summer. What came out of my kitchen as a result was black beans and salsa–which we ate with tortillas and fresh cheese. I roasted the onions and peppers on the stovetop before adding the blacked parts to my tomato pulp (procured by “shredding” the tomato flesh on the cheese grater). The more time consuming the project is, the more time I have to think on them! This morning I made homemade cinnamon rolls–too many! I still have a pan of cinnamon rolls sitting in the kitchen! There’s a gallon of iced tea on the counter-top, and buttermilk just waiting for some biscuits to be made tomorrow. Our basil plant needed to be cut back, so I made a friend’s pesto recipe a couple days ago (and shared the frozen pesto leftover with another friend who stopped by to visit). I may not be able to be all the places that I am thinking of today: Virginia, Tennessee, Chiapas, etc. But each memory inspires something new to happen in my kitchen. Memories of those places are taking over my mind–and dancing across my plate. Oh, yes! I do believe that food is my love language too! I remember when I moved to Mexico, I had the hardest time the first two weeks. I didn’t know what to eat–and resorted to a daily diet of beans, tortillas, fresh cheese, and Valentina hot sauce. It didn’t take long for me to adjust, and now I miss fresh cheese, tamales on demand, and more fresh cheese. I’ve become a little spoiled here in the north. I can buy most items I would buy in the States. What I can’t buy I have learned to live without, or I make it the long way! This has actually been something I revel in, and I have a list I have been compiling of what I will not go back on. Popcorn: It has taken me 30 years of my life to finally make real popcorn. We have lived microwave-less for two years, and that also meant popcorn-less. Until now. Now I am unstoppable. I am a popcorn making machine! I love the flavor, and I am afraid I may never return to bags of popcorn with questionable ingredients. I also love anything that I get to choose my own oil–olive oil popcorn tastes just as delicious! Taco Seasoning: I remember making tacos with my family. We scrambled meat and added this package of taco seasoning. Without it, tacos just weren’t tacos. Well, it should come as no surprise that Mexicans don’t actually season meat with packages of powder. My suegra mother-in-law and my husband make the tastiest meat you’ve ever tasted. They do it with onion, garlic, salt, and tomato. That’s it. I, however, do find myself occasionally wishing for the tacos of my youth. And when I do, in goes a little garlic (powder), fresh ground pepper, cayenne pepper, chile pepper, fresh sea salt, and pepper flakes. Yah. That’s it. Just go easy on the pepper if you are sensitive to spice. Mixed Salad: This is embarrassing. My grandmother would die if she saw the money you spend on bags of salad. Basically, I could make a “fresh spring mix” for a fraction of the cost for the bag of salad. The other thing is the flavor. I think I may be more sensitive to flavors now–because the taste of lettuce in a bag is strange. It also smells strange. Now I buy a couple different kinds of lettuce, wash it in cold water (in my case soak it in disinfectant), then I put it between pieces of paper towel or regular towels and roll it up. I store it in a plastic bag in the fridge, and it stays nice and crispy! Making a mix of lettuces, cabbage, fresh veggies–no big deal. Salad in minutes. Muffins, Rolls, Other Breads: Bread used to be my unicorn. It was some mystical being that I hadn’t personally been introduced to. Victor and I occasionally buy bread, but we usually stick with corn tortillas. Once upon a time, we bought a bag of bread, then we went on summer vacation. I am not kidding: it didn’t mold. I know we live in the desert and that there isn’t much moisture, but bread that doesn’t change in appearance after a month is a little scary. I love making bread. It feels like I am really giving my all to my family and guest when I feed them a warm out-of-the-oven roll. It isn’t that hard, but I have found that, yes, you can leave bread to rise for too long. Cake: Don’t buy cake in a box. Yuck. It tastes bad. Enough said. Flavored Oatmeal: We used to fight over the Strawberries and Cream oatmeal packets when we were young. This is before Quaker got smart and started selling boxes of ONLY Strawberries and Cream. Then, when I was expecting, I read this article that suggesting making your own fruit and oats to avoid extra sugar. Oh my. Oh my! I cook the strawberries first with sugar. Then I add water, milk, and oats. Sometimes I slice apple and cook it with cinnamon and sugar. This is so good. And so much better than a packet of dehydrated fruit, flavored powder and sugar, and quick oats. I use real oats, people. It starts my day off with a bang! I think it is clear that I have a love affair with food. This isn’t even about preservatives, all organic, non-gluten mumbo-jumbo. This is about flavor. It tastes better if you do it right. The fact that it is healthier is a side-benefit! Provecho! When I found out that my mother-in-law was coming to visit us, I was so excited! She’s never been this far from Chiapas, and I had given up hope of having her here. I was excited, but then I got nervous. Not because of normal mother-in-law worries, but because life here is so different than what she’s used to. She wakes up in the morning and crawls out from under the mosquito net that has shredded her bed during the night. It isn’t actually a net, but something thicker–impermeable to good air flow. 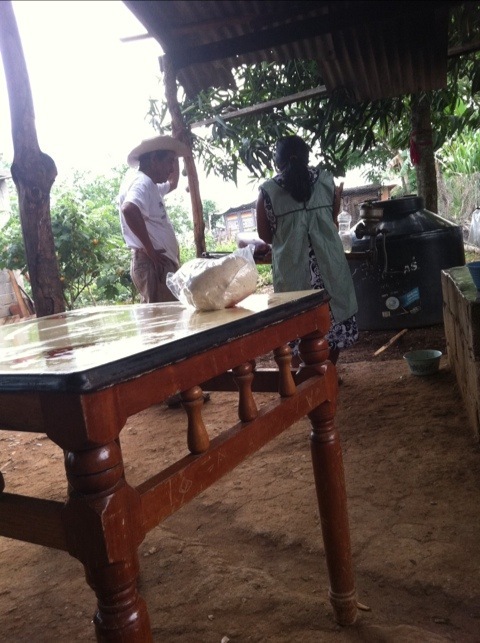 To begin to cook breakfast and coffee, my suegra builds a small fire under her comal. A comal is a flat piece of metal that is commonly used to cook tortillas. She feeds the fire with wood, often adjusting where the heat is focused. Coffee (that she grew and ground) is stirred into a pot of water on the comal. Then she begins the masa–at one time, my suegra would begin to soften dried corn with cal. I just found out yesterday that cal is lye. Yes, the same lye that makes soap… Now she doesn’t make her own masa, but instead buys in cheap from a lady who walks a round selling it. She deftly pats out the tortillas by hand, using a piece of plastic underneath as an aide to turn the tortilla while keeping it from sticking to other things. If my mother-in-law wants eggs for breakfast, she needs to go find them–but often she keeps an eye out on where the chickens are laying around the yards. A handful of rice thrown on the ground is met by a chorus of pio pio, and the little pollitos scramble to eat before their brothers. 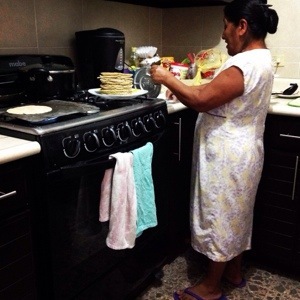 When breakfast is over, my suegra begins her daily chores. She washes one of her several dresses that she switches out throat the week. Other clothes are also washed by hand and hung up to dry. She sweeps–not just inside the concrete floor of the bedroom but the hard packed dirt that covers the area where she cooks and the common area where the family gathers in the yard. Until I visited Chiapas, I would have never guess that you would sweep a dirt floor. If it happens to be a day when the water gets delivered, my suegra starts to clean out the concrete holding tank that keeps a week’s worth of water. She scrubs the tank to loosen any algae that has grown. As the water arrives, bleach is added as an extra protectant from whatever arrives with it. Victor says the water comes from the hills, and if it is the rainy season it is full of mud. This water is used for washing dishes, bathing, and flushing the commode. While they have a toilet (sans seat), they don’t have running water–so she carries water from their water tank to the “bathroom.” It is also used for washing laundry, mopping, and brushing your teeth. When it is time to shower, a large five gallon bucket is filled with cold water, and a smaller scoop is used to dump the water on your body. Luckily, it was evident that my worries were for nothing. The baby has quickly taken to her abuelita, and they are the best of friends. Abuelita does make her were her shoes all the time, as she worries the “cold” tile will make Ale sick. 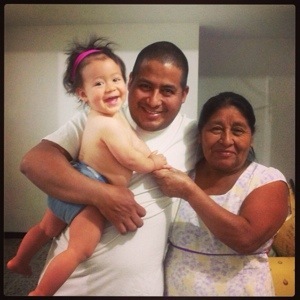 She cooks for Ale rice with veggies, tortillas, and beans–and changes her cloth diapers throughout the day. She’s learned to operate the shower and the hot water. She carries her sweater to warm her up, because our swamp cooler makes her cold. And she keeps busy straightening up, watching Ale, and cooking. The hardest thing for my suegra to see here was the money we spend when we eat out at a restaurant–something we do too often. Well, something we used to do too often… Now, who wants to eat out when you have a little chiapanecan cooking yummy salsas and fresh tortillas everyday? About three years I ago, I self-diagnosed myself lactose intolerant. I was living with my sister in Alexandria, and I noticed that I was having a lot of stomach issues. “Stomach issues” is the way people describe gas and diarrhea when they’re too polite (or embarassed) to admit what’s going on. My “stomach issues” I determined were caused by ingestion of milk products: milk, ice cream, cheese, ice cream. Oh, wait. Did I say ice cream twice? And so I cut out cut back on my dairy food group. They should just rename the dairy block of the food pyramid as Deliciousness. How many servings of Deliciousness do you get per day? When I quit my high stress job in Northern Virginia, surprisingly, all my stomach issues disappear (along with all my autoimmune annoyances…) While some of the autoimmune issues resurfaced with some unexplained inflammation, I haven’t had lactose problems for a year. I’ve heard others comment that it is because the milk is different here in Mexico. Chiapas has a special little insect. I have been getting to know him pretty well this week. Apparently, this is the time of year that the nucú comes out. My first clue was the one that I snapped a picture of several weeks ago. It was the biggest ant-looking creature I had ever seen. A child a school caught it–and we were all fascinated. This was before I found out that people eat these guys. Then I REALLY became fascinated. 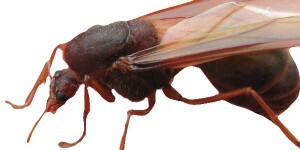 At the ball park (soccer stadium) across the street–we were infested with flying ants. Victor pointed them out–and told me that people eat them when they get big. They put hot sauce on them and eat them with a cold Corona. A girl at work said that people fry them, put lemon and salt on them and eat them in tacos. The little guys have these fragile wings that brush off with the merest friction. The big guys…well, they’re big. I’ve hunted down some pictures for you–but rest assured, my kids will provide me with plenty of opportunities for more shots this week. On my way to work two days ago, I saw this older man and woman walking along the road picking something up. I couldn’t really see what was going on until I got closer. They were snagging all the little nucú insects that had for some reason accumulated through the night. They didn’t pay me much attention, so I kept walking. The last two days as school these pesky friends have really been the rage. It started when I saw that the students had turned paper water cones into holding envelopes. They fit nicely inside their pockets. Then the problem grew when I noticed that several boys were making their way to Oscar’s desk throughout the day. He had turned his pencil-case into a cage of sorts. The next class period, a girl came in with her lunch-container-turned-viewing-center. I couldn’t bear that she didn’t seem to know about the need for living things to have oxygen–so perhaps I encouraged her by poking holes in the top for air flow. I must have encouraged someone, because today I literally had to check pockets and pencil cases to make sure my class was nucú free. Boys came back from lunch with boxes they had added grass and sticks to for a natural environment. I told Pablo that he needed to do something with my pet–and the next thing I know, he zipped it up into his backpack. Friday afternoon found me in Tuxtla at a cab station. This was not just any ol’ taxi service–but the kind that would take me from city puebla to puebla until I reached my destination. My first leg of my trip I ended up in the back seat. I recoiled as I got into the car–realizing that someone has been sweating profusely on the way to Tuxtla. The days have been incredibly hot, and this is intensified if you remember that air conditioning is NOT the norm here… Plus, I think that Mexicans have adapted to hot temperatures, and they seem to sweat a lot. Even my little boys have beads of sweat on their foreheads and upper lips by the time recess is over. Finally I settled back into it, accepting that there was nothing I could do. I dozed off with one arm thrown above my head as the rather rotund couple sharing the back seat spread out. When I awoke, I realized that the señor-next-door was laying on me at each turn. I was happy to arrive in Revoluciona Mexicana, and switch to the front seat (woo hoo!) of my next taxi. This was short-lived when I realized the young taxi driver had a concerning cough. My imagination went into overtime. What disease had he contracted? Should I hand out advice like a real Mexican? I decided it would be best to sit quietly and enjoy the scenery as the car either swerved (to avoid potholes) or jerked wildly (as potholes were ignored). The lady had a baby in the backseat, and Mexican women are perhaps not overly precautious of their infants. The do tend to worry about gripa and such. I rolled up my window to respect her mama-hoodness–aware that more danger was present in whatever was causing the driver to cough every two seconds. My last leg of the journey was where Victor met me. I was happy to see him–and then we shared the front passenger seat of the taxi. This was okay since he’s my sweetheart, but it isn’t abnormal for that to happen with strangers on these trips… The rain cooled our journey, and quickly we arrived to the small town of Jaltenango. Ahh…cool night breeze, home-grown coffee, and the company of my new Mexican family. Totally worth that four-hour/four taxi trip! I have a friend from Knoxville. It’s interesting to tell people about him, because they always think that I met him before I came to Mexico. He’s a total sweetheart–and I also like to say that he is a male version of me. I really think it is because we are southern to the core. We decided a couple of weeks ago that we should have a southern supper. Mainly because who doesn’t like some delicious home cooking when they are thousands of miles from home? Unfortunately, it didn’t work out due to my silly schedule/sickness. Finally, last night was the night. I was surprised. I am so used to people not coming to gatherings, that I really forget who I have invited. We had a house full last night!! In addition to Robert and I, there were nine other people who came. My table seats six. We were squeezed together, sharing seats, swapping seats, and piling on nearby living room furniture. I decided what better southern food then fried chicken, mashed potatoes, and sweet dinner rolls. yum! Now, here is the catch: Yes, I am from the south. Yes, I love to cook. Including last night, that was the second time I have ever made fried chicken. And I am twenty-eight years old! How does that happen?!?! I actually had to call Mama last week (the first time I made fried chicken) to see what I should do. It was really easier than I thought it would be. Now, mashed potatoes I have down to a fine art–but the rolls were really a sensation. I also was able to tell people my baking/quarter-life crisis story. I don’t do it justice anymore. It’s one of the benefits of forgetting bad things: I can hardly remember why life was so tough. I mean, if I think about it, it all comes back, but why do that? I do know this: the best thing (or one of the best things) to come from freaking out and learning to live is when I decided to make bread. I am no longer scared of making bread, and more often than not–it really turns out amazing! The highlight part of the night is when I tasted the tea. “Robert, I don’t know–it might need more sugar.” Grabbing the same ladle I used to take a sip, Robert says, “Yeah, it needs more sugar. I like my tea like Cracker Barrel syrup!” Gotta love a southerner…and his sweet tea.